Unforeseen, infuriating computer issues (an apparently broken CD burner on a non-internety computer that literally spits the disks out from its bowels mid-burn, a new terabyte drive that the spitting machine won't recognize, two other broken external hard drives and an unfortunate tendency to remove thumb drives from home and leave them at the office) have prevented the oh-so-promised Istanbul photo post. However, other exciting news is brewing. The very, very cool folks at Extremely Hungary (an initiative/festival to show off Hungarian art and letters in New York and D.C. throughout 2009) are throwing their own mustache contest and the winner gets a trip for two to Budapest (Porter's favorite travel destination). Put the razors down, boys. Put the razors down. 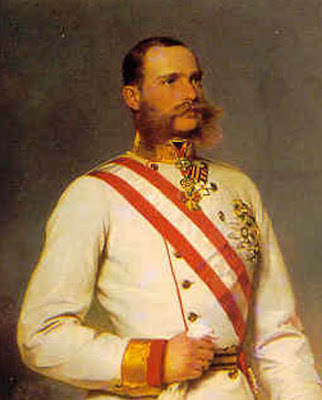 (Franz Joseph, pictured, who ruled the Hungarians (and Austrians) for a bit, would've been a heavy contender). I wonder if bike-beard man knows about this. Your place really is the Bermuda Triangle of IT! Can't wait to see the photos. Haha! I know! Was your phone ever the same?? Sorry to hear about the technical difficulties! Can't wait to see your photos. Well I've just stumbled across your site (dragging my feet through the interweb's rustling leaf litter as one does) an eclectic mix indeed! And those names....Hollister and Porter - we in England tend towards the more mundane - humdrum Helens and commonplace Colins. Do friends call you Holli and your sister the more ambiguous Port?